By this time of the year we are OVER winter clothes. I know that the weather is cold and we have a few months til summer is upon us but we are OVER winter clothes. It is hard to believe that within the next two weeks we should start receiving summer 10 fashions from a few of our suppliers! (I can't wait!) It is like I am willing winter to be over and summer to begin. So for us to have a gorgeous shop all ready and tidy for the new arrivals we must clear all our winter ranges and that means heaps and heaps of saving for you, our lovely customers. 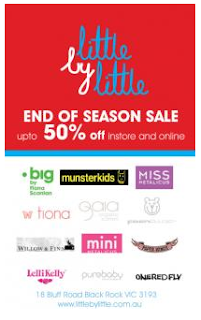 There are saving from everywhere, Big, Fiona, Fred Bare, Two Belles, Tommy Rocket, Purebaby, Gaia, Mini and Miss Metalicus, Munster, One Red Fly... the list goes on and on... And its up to 50% OFF more importantly! It starts in store and online on Thursday 17th June until sold out. And believe me things sell out very very quickly.